I did not do a nine months home post for August as I did for Leo because we were very busy at that time. It also didn’t feel that much had changed from six months, although we were on the verge of several big changes. I very MAD at you! NO, dat MINE! You not take dat! No, don’t go! Come back! We also felt that August had overcome his separation anxiety enough to be enrolled in the same special needs preschool that Leo attends. It is only 3 hours a day for 4 days a week. After extensive testing, he was determined to be low average in all areas but social/emotional development. That’s great for having been home only 9 months at the time of testing! We all think he will catch up quickly. At school he interacts with other children his age who are typically developing. He also receiving a little occupational therapy. They are planning to give physical therapy as well after the surgical intervention on his leg is complete. August was hesitant only a day or two. He absolutely loves going to school now. I think his favorite part is riding the bus. August was only at school for a few weeks before he had a break to have his leg surgery. After consulting with a doctor about 5 hours away, and one 2 hours away, we ended up going with a doctor at our local hospital. They recently recruited one of the top orthopedists in the country, but it took a few months for him to move here. We were very happy with him after our initial appointment so we scheduled the surgery for the end of November. 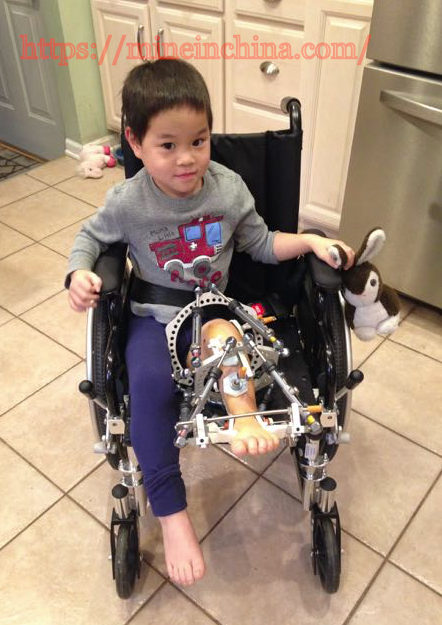 August currently has an external fixator, a metal frame mounted into his leg bones, on his left leg. He will wear it for about three months total. Currently, we are planning to have it removed around the end of February. He will wear a leg brace after that. Leo had cleft surgery about 2 months home. 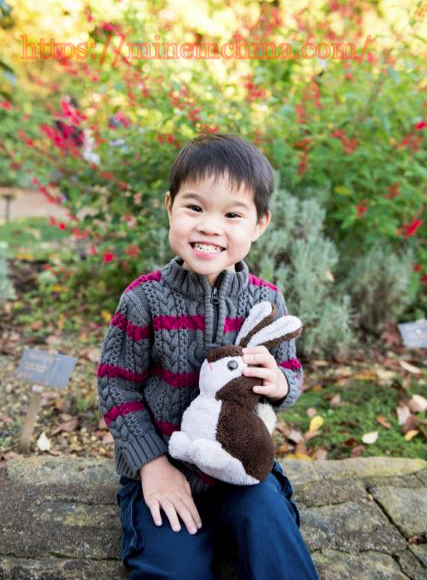 We hadn’t planned to wait nearly a year for August’s surgery, it just worked out that way. I know many families struggle with the best timing for major surgeries after an adoption, so I plan to share more about our two experiences in a future post. For now I will say that it worked out very well for us. I was able to explain to August what was happening. It was wonderful to have him wake up at the hospital and be able to say “Leg really hurts!” or after the pain medicine kicked in, “Feel better now. I go to school today?” After one trip to the orthopedist where some parts had to be switched out on the fixator, he spent the entire trip home ranting to me. “I not like that doctor! He so mean! I very angry at him! I not like him! We go home, we not go see that doctor!” Having him so verbal by surgery time made a huge difference. Aside from the major surgery, August continues to be happy and healthy. 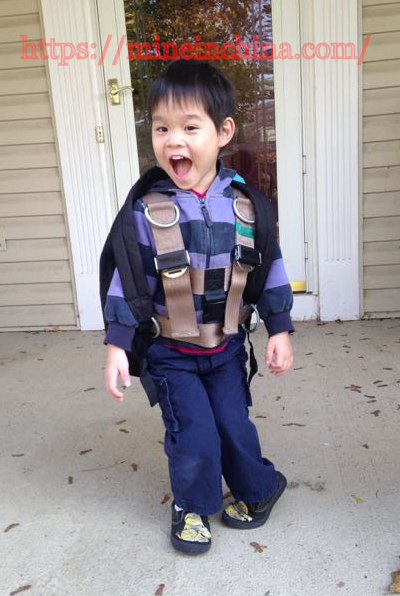 He loves playing with Vincent and Leo, but also happily plays independently with his collection of cars. August misses being able to walk, but really enjoys running over people with his wheelchair (watch out!). We thought winter would be a good time to have the surgery because he couldn’t play out on the playground then anyway, and Christmas would be a good distraction. Having your first Christmas as a 3 year old is an amazing experience. August thought everything was magical, and opening presents on Christmas day was the best day of his life! At one point he opened a simple remote control police car. When he pushed the button and the siren went off, he said “Oh, I love you! I love you!” to the police car. He makes us laugh every day. We’re so happy to have his larger than life self in our family! This entry was posted in Uncategorized and tagged August on February 3, 2017 by minefam.